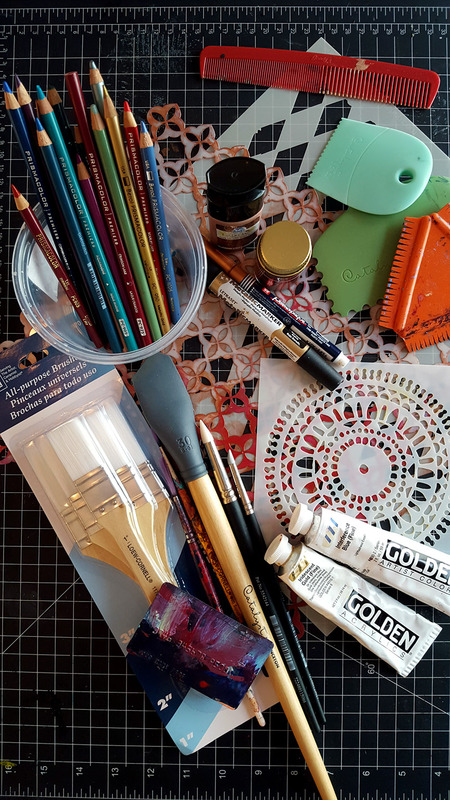 I have art supplies that I consider to be my tried and true go-to’s. They are my favorites, my trusties, my familiar friends in the creative process. I thought I would take a moment to share the things my artist self can rarely do without. – Cheaply priced, run of the mill all-purpose brushes with synthetic bristles. I can get a set of 3 from 1 to 3 inches for under $5. I love the way they pull paint and help me avoid the depths of guilt when I inevitably forget to wash them out. 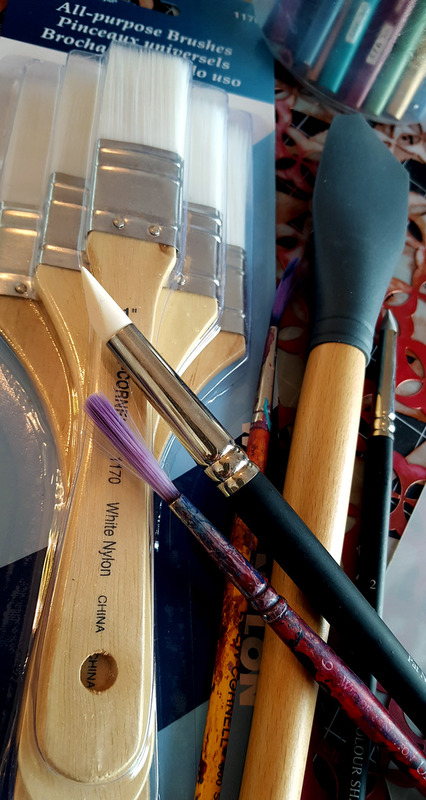 – Thin, long bristled brushes. These are great for creating organic lines, I couldn’t reproduce intentionally even if I tried. They keep me open to spontaneous instead of over controlled brush strokes. 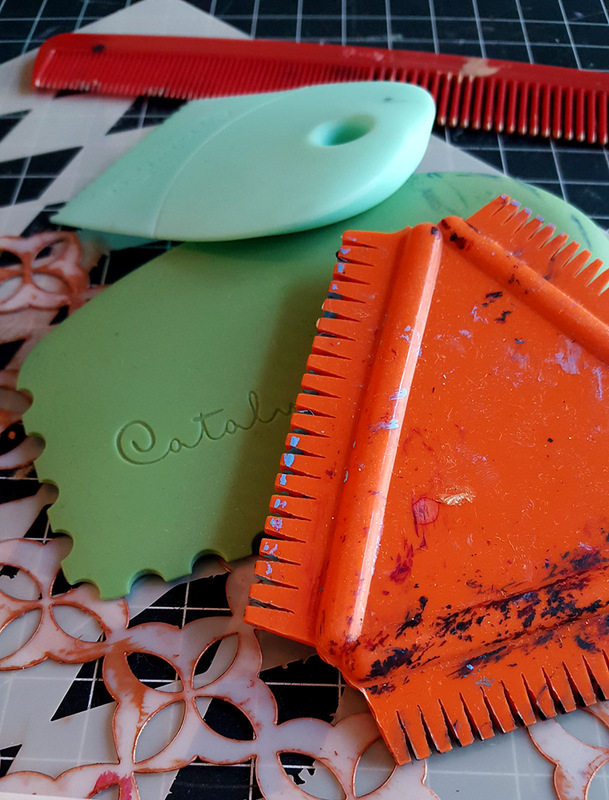 – Rubber tipped wedges of various sizes and patterns by Catalyst, some with paintbrush handles, others held in the palm of my hand. These are a brilliant invention for pushing paint around in unusual ways and making interesting effects. – Hair combs, plain and simple. They will always be appreciated more for their creative mark making rather than their futile job of taming my hair. 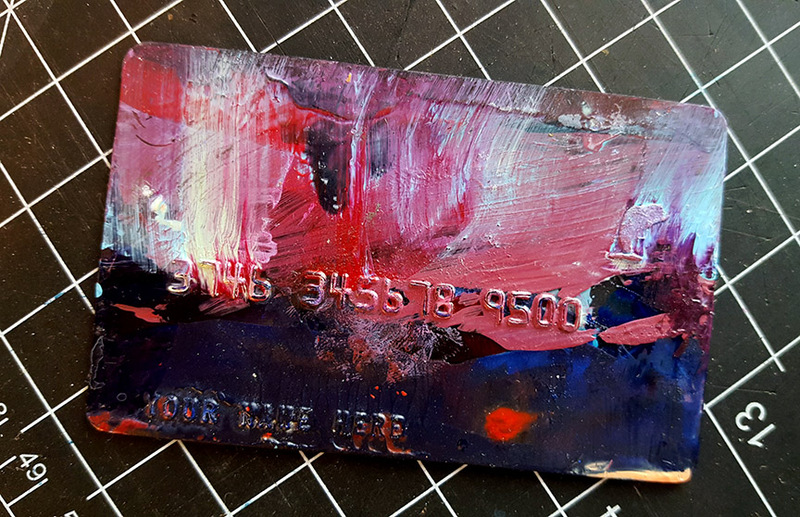 – Credit Cards, more trusted in my studio than in my wallet. I finally found something to do with all those plastic credit card advertisements I get in the mail. I have been using them for years. 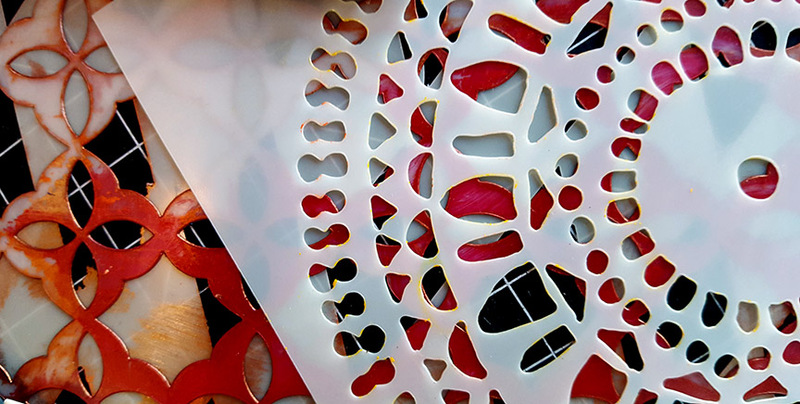 – Stencils . I have an obsession with them. I love their uniformity and the fact that I can now get all kinds of designs. I first fell in love with such repeated patterns when in North Africa. Now, my love for stencils has invaded much of my work. – Interference Blue. My life changed when I purchased my first tube. I’m both intimidated and inspired by its liquid magic. Just a touch can create powerful and iridescent highlights. 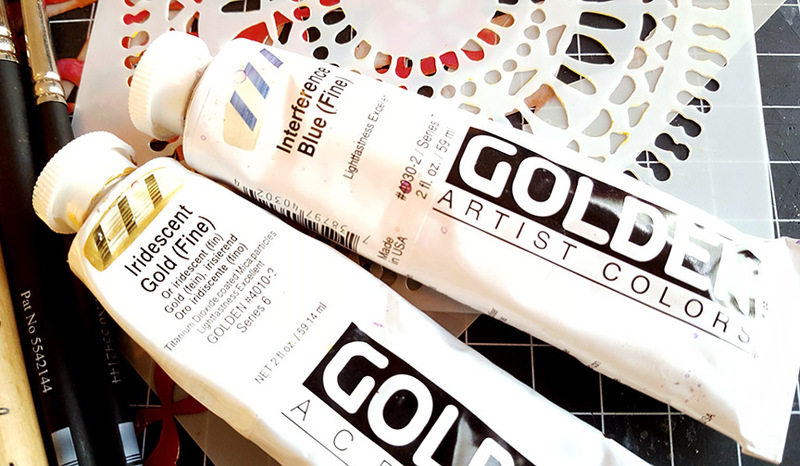 – Metallic colors, for which I am a sucker. I use them l ike the royalty I am not. 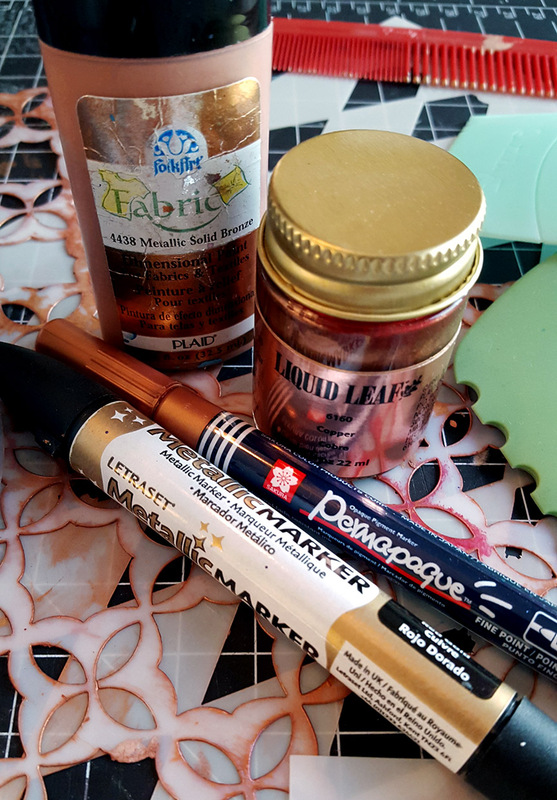 Liquid copper leaf, 3 – dimensoinal acrylic paints, permanent paint pens. I want gold, silver, copper, and bronze in any form I can get it. 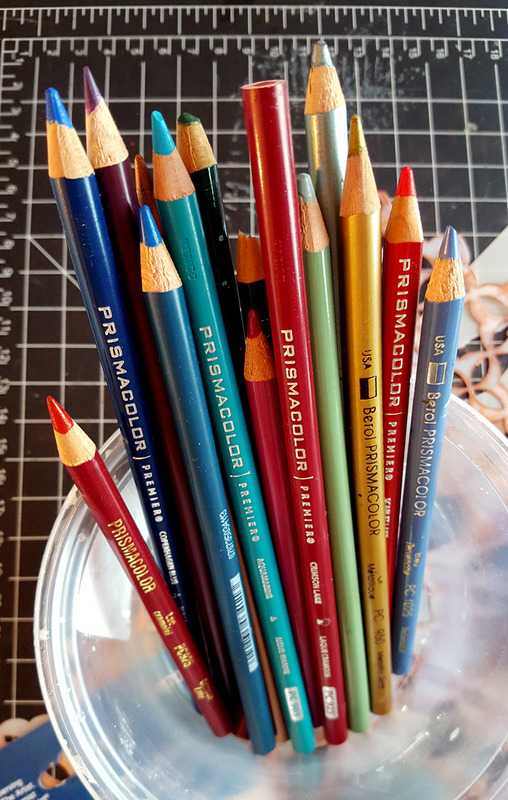 – Prismacolor pencils. Last but certainly not least. I am still using the massive set I was required to bring to my junior high geography class for map coloring! These have stood the test of time! I have, of course, had to replace my favorite colors over the years, but I have gotten more than my (mom’s) money’s worth out of the set. They deliver such a delicious and vibrant punch of color to drawings and also paintings. I even use them on wood!